Can a notice that never arrived be properly served? The Harper Report: A defining moment or an impossible dream? The purpose of this article is to consider whether a set-off under s 553C of the Corporations Act 2001(Cth) may be relied on as a defence to the various statutory recovery claims available to a company’s liquidator under the Act, with particular reference to unfair preferences, uncommercial transactions, void dispositions and insolvent trading. That question, though capable of simple expression, gives rise to considerable complexity. A line of authority has developed in Australia in favour of the view that set-off may be available against those claims under s 553C, including at intermediate appellate level, as a consequence of comments in the New South Wales Court of Appeal in Buzzle Operations Pty Ltd v Apple Computer Australia Pty Ltd (2011) 81 NSWLR 47. It is contended in this article that that view is wrong as a matter of principle, and that a set-off should not be available for three reasons. First, a set-off would be contrary to the statutory purpose of the claims, being to benefit unsecured creditors. Secondly, and related to the first point, there is a lack of mutuality. It is commonly said that mutuality is determined by reference to equitable interests, but the expression of the principle in those terms does not always explain mutuality. It is suggested that in some cases the answer may be found in the concept of beneficial ownership, using that expression in the sense of ownership for one’s own benefit, and a consequent right to deal with property as one’s own, as opposed to the interest of a beneficiary of a trust in the strict sense. Thirdly, the statutory claims do not arise until after the time for determining the availability of set-offs in the liquidation, and are not properly characterised as contingent at that time. The contrary view, that the claims exist as contingent before the liquidation, is supported by the decision of the New South Wales Court of Appeal in Vale v TMH Haulage Pty Ltd (1993) 31 NSWLR 702 in relation to insolvent trading and also, arguably, by the recent analysis of the United Kingdom Supreme Court in Re Nortel GmbH  AC 209 in relation to proofs of debt for statutory liabilities. 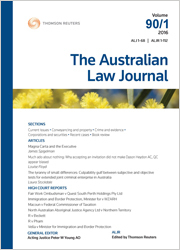 But it is suggested that there are difficulties with those cases in Australia, particularly in light of the reasoning of the High Court in Foots v Southern Cross Mine Management Pty Ltd (2007) 234 CLR 52 in relation to proofs of debt for costs orders. Nevertheless, a distinction arguably may be drawn on this third issue between director liability for insolvent trading and the other statutory claims (including holding company liability for insolvent trading). There is an argument in the former situation that the statutory claims exist as contingent before the liquidation which would not be available in relation to the latter. In Mainteck Services Pty Ltd v Stein Heurtey SA (2014) 310 ALR 113;  NSWCA 184, the New South Wales Court of Appeal rejected the view expressed by the High Court in Western Export Services Inc v Jireh International Pty Ltd (2011) 86 ALJR 1, that before evidence of surrounding circumstances is admissible in construing a written contract the language must be “ambiguous or susceptible of more than one meaning”. This conclusion was said to be mandated by the High Court’s later decision in Electricity Generation Corporation v Woodside Energy Ltd (2014) 251 CLR 640. This article argues that the Court of Appeal was plainly wrong to reach that view, and it should not be followed. As a matter of precedent and principle, Codelfa Construction Pty Ltd v State Rail Authority (NSW) (1982) 149 CLR 337 remains good law.